On behalf of Bartkowiak GmbH, MediaScreen GmbH realized the interactive multimedia media technology concept for the visitor center of the RAG control room in Herne. The content presented there informs about the past and future of coal mines after the final cessation of German hard coal mining in 2018. The media installation consists of a 12 x 55", 726 cm wide 0.9mm Narrow Bezel LG display video wall with laser tracking interface, touch function and stereo speakers. Another 8 x 55" display video wall is also operated via laser tracking and equipped with stereo speakers. Furthermore, three information counters each with 27" touch display were installed. 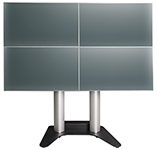 Three vertical 88" LG info steles with 9:32 aspect ratio and 1080 x 3840 pixels complement the fiber-networked multimedia presentation system. The interactive content was programmed by MediaScreen with VENTUZ 3D real-time authoring software. MediaScreen GmbH has implemented a softedge projection with 3 laser DLP projectors for the Motel ONE in Bonn. The softedge projection complements the transmedial video and painting art installation from the artist Gudrun Barenbrock. For the Motel One Bonn location, the master student of the Kunstakademie Münster has created a unique mix of art, moving images and music. MediaScreen delivered three air-conditioned Laser projection units for the Polarium of the Zoo Rostock with fully regulated dual-circuit air conditioning and condensed water evaporation. 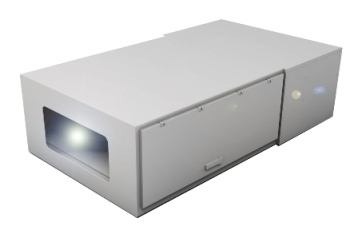 The light source consists of laser DLP projectors with 10,000 ANSI lumens each. The panorama widescreen projection was realized by soft edge projection. MediaScreen realized on behalf of the Decathlon Sportspezialvertriebs GmbH an 3 x 3 display video split wall. The video wall consists of nine 46" high brightness displays, which was mounted and fine-tuned by means of a special wall mount. The signal playback and content update takes place by mediaplayers and a content management system. MediaScreen realized on behalf of the Decathlon Sportspezialvertriebs GmbH an 2 x 2 display split wall in the stairwell. 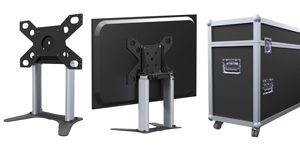 The video wall consists of four horizontally mounted 55" high brightness displays. The signal playback and content update takes place by means of multimedia PC and a content management system. MediaScreen realized a vertical 2 x 2 55" display split wall on behalf of Decathlon Sportspezialvertriebs GmbH. The video split wall consists of four vertically mounted 55" high brightness shop window displays, mounted on a rollable frame. The signal playback and content update takes place by means of multimedia PC and a content management system. On behalf of the Munich-based architects HH Architekten, MediaScreen created a display brand wall for the brand store of the popular bag and lifestyle accessory designer Reisenthel. The video wall consists of four masonry-embedded 55" high brightness displays. The signal playback and content update takes place via network-enabled BrightSign media players and a content management system. On behalf of Hirmer Herrenmode GmbH MediaScreen realized a vertical shop window video wall installation in portrait format. For this purpose, four sunlight-suitable 55 " high brightness displays were integrated into a rollable and decorative display stand system. The signaling and content update was made with network-compatible media players and a content management system. MediaScreen developed an elegant and ergonomic mobile CAD workstation for a well-known CAD / CAM software manufacturer for use in dusty production environments. The CAD / CAM construction-tool has barrier-free continuously adjustable electrical height adjustment, robust aluminum surfaces as well as a powerful high-performance CAD PC. On behalf of MOTEL ONE GmbH, MediaScreen GmbH implemented an exclusive LED media technology installation in the bar of the Motel ONE Parkstadt Schwabing. The high-resolution LED Videowall was mounted invisibly behind a semi-mirror. When switched off, the LED Video Wall is not visible. If the 2.5 mm LED Video Wall is switched on, the video content will appear like a ghost hand in front of the surprised bar guest. 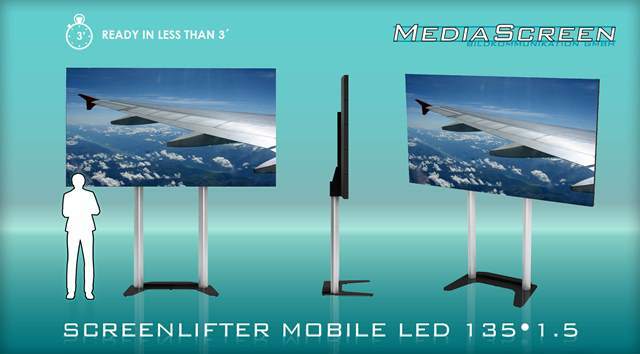 MediaScreen supplied its MOBILE LED presentation system for an event of a logistics company. The MOBILE LED presentation system was used, as the venue did not allow projection in a daylight environment and the construction of a modular LED video wall would have been to time and cost intensive. In cooperation with WBLT GmbH, MediaScreen realized an interactive half-sphere projection for the visitor center at Munich Airport. In the idle mode the interactive show, which is programmed with VENTUZ software, shows the flight routes from Munich-based airplanes. In the interactive mode, visitors can view on information about destinations on the surface of the spherical projection. On behalf of Hirmer Herrenmode GmbH, MediaScreen implemented various shop window display installations. For this purpose, several 47" sunlight proved were integrated into decorative steels in the shop window. The signaling and content updates was made with network-compatible mediaplayers and a digital playout center. On occasion of the K-Fair 2013 Dusseldorf MediaScreen installed on behalf of the Steinbeis Research Center, an interactive 4K LED video wall for the booth of Coperion. The high resolution LED video wall had a size of 10 meters x 5 meters and consisted of 200 LED modules with 2.6 mm pixel pitch. MediaScreen executed on behalf of the kplus concept GmbH, Dusseldorf the media technology installations for the new store designs of the Decathlon City stores in Munich and Stuttgart. Within this project MediaScreen installed a 2x2 NEC Multisync split video wall with a gaming in Munich. In Stuttgart, a 75" Samsung LED display and gaming pc was installed. At this gaming station customers can explore the stores and the DECATHLON product world with an interactive "Run the Store" game. In collaboration with VOK DAMS Events GmbH, MediaScreen created a permanent multimedia exhibition for Volkswagen Financial Services AG at the recently opened DRIVE location in Berlin, Germany. The "Key To Mobility" theme accompanies the visitor throughout the exhibition. The interactivity of the different exhibits makes the visitor an integral part of the concept. The tour begins at the "Living Wall" installation, an interactive wall projection 7 meters wide and 2.8 meters tall. A laser system tracks the movements of visitors as they pass along the length of the wall, and responds by displaying interactive elements. Having passed the "Living Wall", the visitor is greeted by an interactive avatar explaining the exhibition and encouraging the visitor to enter the main area. The avatar installation uses a 80-inch display in portrait mode and laser tracking. Upon entering the main area, the visitor arrives at the interactive "Media Band" built from 47-, 55- and 65-inch displays with motion tracking. The challenge for this installation was to match the content to the different display sizes and resolutions to create a harmonious whole. Two "Future Scope" Holosion (“Peppers Ghost” method) tunnels await the visitor at the "Financial Comfort Zone". The "Future Scopes" use layered projections to create the effect of objects floating in mid-air in front of the viewer. The "Interactive Display Cabinet" employs a transparent touch display to layer relevant interactive information over physical objects. The "Mobile Future Window" installation is a 3x3 video wall built from 55-inch narrow-bezel LCD displays, and serves as an interactive guidepost to the exhibition. Depending on the visitor's position in space (captured with a camera tracking system), different information related to the mobility theme is presented on the video wall. At the photo station, the visitor can have his picture taken in front of a green screen. Using face mapping techniques, the visitor's head is isolated and pasted into one of several selectable images (race car driving, bungee jumping, etc.). The visitor can then share the image via email or have it printed on site. On the occasion of the Football World Cup 2014 MediaScreen provided two ScreenTower 100" as well as a 20 sqm rear projection with 30,000 ANSI lumens for outdoor use in Starnbergs beach club Undosa. For the award of the Bavarian Television Award 2011 MediaScreen installed a 20.000 ANSI lumens tandem rear projection and various 50 "and 42" plasma displays for the stage design. MediaScreen GmbH delivered on behalf of the creative agency Imagination a MediaSphere Multitouch for Woodside Petroleum Ltd. to Sydney and Paris. The interactive content was programmed by MediaScreen with VENTUZ real time 3D software and illustrates the global Oil and gas extraction activities of Woodside Petroleum Ltd.
MediaScreen GmbH fulfilled built by order of Saurus GmbH the multimedia presentation technology for the interactive exhibits of the special exhibition “Wellcome to Anthropocene!” in the Deutschem Museum. The installation consists of 61 LCD displays from 15 up to 80” screen size, 40 CF MediaPlayers and 100 operating buttons for the presentation of the audio-video- and multimedia contents and also 25 audio amplifiers for the numerous 4” up to 15” loudspeakers. Furthermore, the exhibits were equipped with vandal-proof one-handed headphones. The touch displays have an uninterrupted power supply and were controlled via a PC. MediaScreen delivered on behalf of the agency CAMAO for "Pristine Seas" Exhibition on Sylt a MediaSphere multitouch and took the VENTUZ programming of the by National Geographic provides data and video content. For the fourth year in succession, the fragrance Davidoff engaged in cooperation with the National Geographic Society to support the Pristine Seas program. The aim of this initiative is to discover world vulnerable marine ecosystems to protect them. MediaScreen realized for the Munich department store Hirmer a vertically mounted video wall over 7 floors. The video wall was made with more than 60 Full-HD 46" and 50" SAMSUNG LCD seamless display. The content distribution was solved by means of a cluster-based content management system with over 60 cluster clients. MediaScreen delivered on behalf of the 3Monkeys a MediaSphere for the Arab Strategy Forum 2014 to Dubai. The Arab Strategy Forum brougt together world leaders and opinion makers to discuss the future of the world and the Arabc region. The MediaSphere was used together with a panoramic 3D projection to present a political and economic outlook into the year 2015. The interactive content was produced by 3Monkeys with VENTUZ software. On behalf of the Swiss community Wohlen MediaScreen installed the multimedia technology concept for the new straw-museum. The exhibition concept was designed by the design agency „Im Raum - Furter-Handschin-Rorato“. The new straw museum in the park is dedicated to the history of the Swiss hat-weave industry. To visualize the global aspect of the straw industry, a MediaScreen MediaSphere Multitouch was selected as an interactive exhibit. In addition, the huge collection of specimen sample books have been digitized and can now be viewed on the MediaScreen MonkeyBook – Interactive Virtual Book. On occasion of the K-Fair 2013 Dusseldorf MediaScreen developed on behalf of the Steinbeis Research Center, an interactive multimedia presentation system for the booth of Coperion GmbH. The centerpiece of the multimedia installation was a 14 meter x 5 meter convex soft-edge spherical projection, which was controlled interactively via an external touch terminal. MediaScreen developed an interactive showcase installation for the promotion of the new online shop of the Munich department store Ludwig Beck. The interactive shop window installation consists of a transparent touch-screen display, which was combined with an interactive operating rotary plate. On the transparent touch display users can get more information about the presented products on the rotary table even outside the regular opening times. For a client's fair booth at the Dubai Motor Show MediaScreen created a virtual X-ray scanner as a unique way to illustrate an engine block's inner workings. A transparent 46-inch touch display could be moved on a circular sliding rail while the showpiece was resting on a pedestal in the center of the circle built-in sensors provided precise angular position feedback to a graphics workstation running Ventuz presentation software.This allowed to teach the user the special characteristics of the engine and made them visible through the transparent display, while the user pushed the carriage around the engine. The informations was accurately synchronized with the position of the carriage. For the Natural History Museum in Austria (Vienna) MediaScreen created an elegant freestanding HoloScreen glass stele. To present the graphics, a powerful projector was discreetly installed on the ceiling. At ISE 2012 in Amsterdam MediaScreen presented an exciting combination of the MediaSphere Multitoch presentation system and the ScreenLifter Split with four 50" displays, which was linked to an interactive presentation system. The extra therefor produced content was programmed in-house by the VENTUZ software and showed interactive flight-routes in a real-time simulation. On behalf of ZDF MediaScreen provided the studio presentation technology for the successful TV format “Wanna Bet?” The set-up consisted of a panorama projection with eight high power Christie S+16 and Christie S+20 DPL projectors, 16 radial arranged ORION PDP seamless displays in the guest entry zone, a Orion PDP video wall as well as a large screen projection. Media Screen created for the AUDI A8 Middle-East presentation an exciting "virtual X-Ray System" for visualizing the hidden automotive technology of the premium manufacturer. The 65" display was mounted on an electrically operated rail system and was controlled by a AUDI MMI joystick. The CAD content interacted with the geometric position of the display, thus was creating the perfect illusion of a real X-ray image. For the WALL AG MediaScreen realized the presentation technology for the out of home advertising system in the Berlin subway. The projection system compised special projector dust-proof housings with dual zone climate control as well as specially modified 3-chip DLP projectors for continuous operation in dusty environments. The MediaScreen POI-POS service package thereby ensures the optimum cost control for the entire useful life. On behalf of the MAKE IT REAL GmbH, MediaScreen delivered innovative touch-presentation systems on occasion of the NIVEA 100th anniversary celebration in Hamburg. The multimedia concept comprised a 180° MultiTouch Sphere projection system and two WTH 65 HoloInteractive presentation screens. MediaScreen delifered to the National Library of Uzbekistan, a 180 degree multi-touch Sphere projection with a diameter of 160 cm. The cusom-made multi-touch MediaSphere solution has been integrated into a noble designed pedestal in the form of a concave hemisphere. Additionally two MonkeyBooks Interactive were installed. On the occasion of the AUDI MMK 2011 MediaScreen supported with an interactive multimedia package, consisting of two WTH 65 HoloInteractive touch presentation systems and a 180 ° multi touch hemisphere, which content interacted with a 103" plasma display. The required content was produced by Media Screen with VENTUZ and Flash. On behalf of the Expology in Oslo MediaScreen implemented a multimedia exhibit in the Aker Solutions showroom. 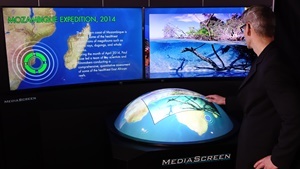 A tailor-made version of the MediaSphere Multitouch spherical presentation system was used. Three DLP projectors have been integrated into the MediaSphere case, which project on around mounted HoloScreen touch-projection screens. In this way the spherical content of the central hemispherical projection can be controlled interactive. The content production has been produced with the VENTUZ software. On behalf of NOBEO GmbH MediaScreen execute the innovative presentation technology for the set-design of the new WDR production “The fantastic quiz of humans”. The media design concept comprised a vertical floating holographic projection screen with 4:3 aspect ratio in portrait-format. The HoloScreen was used to visualize the internal functions of the human body. The projection technology was composed of Christie Xernon DLP projectors with 32.000 Ansi Lumens and special acoustic enclosure cabinets for high performance projectors. MediaScreen delivered on behalf of Stereolize Ltd. seven WTH 65 HoloInteractive rear projection systems on occasion of the 125 Year’s Peugeot anniversary in Valencia, Spain. On the Media Screen Open House 2009 event the guests could see numerous innovations in holography, 3D presentation, Interactive Interfaces, digital signage and TV studio applications. MediaScreen presented here for the first time the brand new Dimensional Staging - Virtual 3D realtime TV Engine system to display 3D effects in TV formats. The stunning 3D effect is achieved here by the synchronization of the content to the camera position. The position of the camera crane is tracked so. Other exhibits were the MediaSphere Multitouch, the MonkeyBook Interactive, the HSI 66 HoloInteractive presentation system, stereoscopic 3D displays, ScreenLifter 85", 103" and ScreenLifter 85" Lite and the currently world's largest 3D HoloScreen 135" in 16:9 and 130" in 4:3 aspect ratio for figure vertical objects eg People in life size. At the opening ceremony of the new King Abdullah University of Science and Technology provided MediaScreen numerous innovative media systems and media installations to Jeddah in Saudi Arabia. On an exhibition area of 10,000 square meters covering all aspects of the new university as well as the milestones of the arab, islamic and western science have been illuminated impressively by means of interactive installations, 3D visualized and therefore effectively experienced.Media Screen has been given the honour to visualize the multimedia infotainment fireworks worthy with innovative presentation technology. In addition to the four-week build-up time in scorching heat, Media Screen had to pass a hitherto unprecedented material battle. Besides 54 high-performance DLP projectors and 29 interactive Media Screen WTH Holo- Interactive projection systems the equipment for a more than 3 m wide hemispherical projection, numerous multi-touch displays and other displays were delivered and installed on site. Among others a 15x2 meter and three other 9x2 meters soft-edge panoramic projections with interactive control by means of laser-interface were used. This "Time Tunnel" projection visualized a journey through the achievements in the relevant scientific discipline. The visitors here triggered a variety of animations by laser tracking interface by hand gestures. To convey additional information 23 MediaScreen WTH Holo Interactive projection systems with 3D user interface came to use. Visitors were able to navigate them through thousands of images and video and text content in different languages. For the detailed presentation of the respective departments four interactive coffee tables with built-in 42" multi-touch displays were available for the professors. With the ScreenTower 181" MediaScreen produced the world's largest rear projection system for exhibitions, public events and permanent installation in conference rooms, control rooms etc.The ScreenTower 181" has a diagonal of 4.60 m in 16:9 format with a width of more than 4.00 m. With its 30,000 ANSI lumens light output and native full HD (up to 2K) resolution, the ScreenTower 181 " does not only set standards in the image size but also in resolution, contrast and brightness. In addition, the projection system is compatible to the cinema directives DCI. The ScreenTower 181” was developed as high quality and inexpensive alternative to high-resolution SMD-LED video walls and persuade with LED adequate brightness and up to seven times higher resolution while excluding the typical LED pixel structure, moiré and the high noise emission of typical LED video walls. Media Screen realized a comprehensive multimedia concept for the Company-Museum of the traditional lifestyle brand Mustang Jeans. The multimedia installation comprised nine rooms, each with individual media technology. The application comprised many LCD displays with integrated CF media players to play publicity and information movies in continuous operation. Another installation revived three-dimensional horses and dolls to life with the help of projections and Surround Sound. Due to the unique, interactive motion sensors the visitors activate the each epoch appropriate sounds. About this the visitors can navigate through all decades of the manufactures history via Touch-Screen Displays. The specially-built Mustang cinema was equipped with a high-performance projector and 5.1 Surround Soundsystem. The entire multimedia installation is WLAN-Touchpanel controlled. Thus, every single system in the complete multimedia installation can be adjusted to the respective setting. On the occasion of the Haydn museum’s opening in Esterhazy palace in Eisenstadt (Austria) MediaScreen realized on behalf of Interactive Media Solution GmbH an extensive visualization concept. In addition to several projection systems a complex 4-fold softedge ceiling projection could be achieved. A particular challenge was the historic structure of the building. Previously all ceilings and walls had to be measured by laser and brought in a proper projection geometry via specially constructed projection and mirror frames. Besides the softedge technology seven 3-chip DLP projectors with 6,000 ANSI lumens each came into operation. On behalf of White Balance GmbH MediaScreen realized the innovative presentation technology for the new set design of the ZDF production "Das will ich wissen!". The design concept was created by star designer Florian Wieder and consisted amongst others of three floating holographic projection screens in 16:9 and 4:3 aspect ratio and some further rear projection installations. The projection technology was made by nine 3-chip HD-DPL beamers. The two adopted 130" holo projection screens were the world's largest “real" (laser based holograms) holographic screens and lead to the typical innovative appearance of Florian Wieder’s design. As part of the "Bayern Innovativ 2007" exhibition in the BMW World, MediaScreen presented a further, inhouse developed 3D-display innovation. The VR-Mirror represents our core competencies in the range of 3D-Multimedia presentation systems. The presentation system is a hitherto unique combination of 2D and 3D technologies, and was designed for use at trade shows, events as well as for Digital Signage installations. The extraordinary visual effect of a freely floating three-dimensional body works without the normal mandatory 3D glasses like in the comparable installations and thus ensures maximum attention and a lasting memory in your product presentation. The 3D-Content was made with our partner CAT PRODUCTION computer animation. On the occasion of the “Flush in Color” public event of the event organisers Otger Holleschek und Matthias Schlick, MediaScreen realized two colourful and bright panorama projections inside and outside the location. The light and video art scenery was projected with 10 projectors and total 80.000 ANSI Lumens light output. For the TV-Production “Stars on Ice” MediaScreen supplied two rear-projection systems with each 24.000 ANSI Lumens powered by 3-chip DPL projectors. On the occasion of Pope Benedikt XVI visit in Bavaria Mediascreen supplied two ScreenTower 125. The ScreenTowers were placed in the side ships of the cathedral to make the optimum view of the leader of the catholic church for the numerous visitors possible. On behalf of the design agency mehr:wert Mediascreen developed interactive parts of the media technique concept for the innovative Caterpillar exhibition booth on interMat 2006. Among other things MediaScreen created in cooperation with mehr:wert the “i.tool_holosphere” presentation system. A ScreenTower 125 with interactive content was gesture controled by a i.tool_frame. On behalf of AdEvents, Mediascreen GmbH supplied the video technology for the Bavarian EON Culture Award 2006. The data and video content was distributed by six networked high-performance computers and video-mixers and combined to a brilliant triple projection. The import of the live-camera short-takes and audio signals completed the multimedia presentation. On the occasion of the echo award 2006 MediaScreen installed a mobile Barco iLite 6 XP LED video wall. Furthermore MediaScreen installed two 50" plasma displays which were used as a teleprompter. MediaScreen realized the visualization concept of the Bavarian Television Award 2006. The main stage scenery was made with a 20,000 ANSI lumens tandem rear projection and competed with nine 50" and six 42" plasma displays. Two ScreenTower 84" ensured brilliant images during the aftershow party. MediaScreen designed and manufactured a three side wide screen panorama 3D-Stereo Cave projection for SIEMENS. MediaScreen realized on behalf of the design agency Peyote® a 3D Holosion for a pharmaceutic product presentation. The 3D application was created with a X3D 50" plasma display as well as a twice deflected semi-mirror projection, which allowed the 3D viewing without the otherwise inevitable 3D glasses. As an additional highlight, the 3D Hollosion could be used by gesture control via the Peyote® infrared i Curtain technology. MediaScreen designed and manufactured for the Electrolux exhibition stand a virtual kitchen studio. About the rear projection system, the various kitchens designs were projected on multiple rear projection screens. With different projectors the various kitchens Designs were projected and combined with genuine kitchen devices. The special media application was a highlight of the exhibition. The content was created over 3 synchronized multimedia PCs. On the occasion of the Echo Award 2005 MediaScreen supplied a mobile Barco iLite 10 LED video wall as well as two tandem front – and rear projections with each 24.000 ANSI lumens. Over this MediaScreen installed two plasma displays over the main stage which were used as a teleprompter and as preview video monitor for the artists. Media Screen GmbH supplied for the BOSCH booth a 125" 3D cinema projection with a powerful 5.1. Dolby Digital cinema sound sytem. Particular emphasis was placed on an extremely powerful projection that allowed the high-contrast viewing of 3D content even during the bright fair light environment. On the occasion of the AUTODESK Software presentation MediaScreen realized an 8m x 2m large HD projection consisting of three MediaScreen 125" and three Digital Projection 15 SX DLP projectors with 36.000 Ansi lumens. 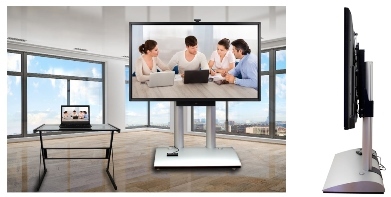 The 125" ScreenTowers could be used as individually single displays as well as a split screen system. For the Echo 2004 the given image area of 20m x 9m had to be fully used. Therefore the projection screen had been parted in two in order to be able to realise this unusual format with a sufficient illumination. MediaScreen solved this problem by means of three 3-Chip SXGA DLP Projectors of the type Digital Projection 15 SX. The complete image had been merged by two triple projections with the softedge generators developed by MediaScreen. The total light power accumulated thus to 70.000 ANSI Lumen. Beside the stage a 6m x 4.5m tandem projection had additionally been made. It was equipped with two Digital Projection 15 SX with telephoto lenses. For the ILA 2004 (Aerospace Exhibition) MediaScreen made several innovative special solutions in the field of media technics. Beside a “solar tunnel” which was realised with a wide-angle-lens rear projection, three more projectors with wide-angle lenses and trapezium distortion were used to implement a half-ring projection. The visual and technical highlight of the exhibition was the first time use of the MediaScreen prototype of a 3D hemisphere with a diameter of 2.8 m. Onto this projection hemisphere a specially animated image of the earth was projected with a 12.000 ANSI Lumen high-power projector and a special wide-angle optic. Additionally MediaScreen provided two further rear-projection screens with 2.4 m x 1.8 m on both sides of the main stage. One of these two projections was a 3-D presentation on polarizer basis giving an impressive inside experience of for example the inside of the ISS station. For the EXPO 2002 in Switzerland MediaScreen realised the at that time greatest 360° panorama projection of Europe on a swimming “monolith”. 10 video animations with 7 m height had been adjoined seamlessly on a cylindric surface of 511 square meters. The distortion in the picture geometry had been adjusted by signals from a newly, by MediaScreen developed, video processor in real-time. The precision of the alignment of the complex geometry had been achieved by specially manufactured 5 axles projector frames. MediaScreen designed and constructed an unusual and demanding special solution of projection for the Bertelsmann stand on the CeBit 2002. The elaborate projection consisted of a panorama softedge projection being realised with three 12.000 ANSI-Lumen DLP projectors. A frame of mirrors around the projection area gave the spectacular visual impression of an infenite horizon. The use of a special partly transparent projection screen of 14 m x 3 m made it possible that the projection could be seen from VIP lounge inside the booth as well as from outside the stand in a congruent picture quality. For the ETH, Zurich, MediaScreen realised the installation of three interactive 3D virtual reality cave projection systems. This installation realised the merging of reality scenes into a virtual reality surrounding for the immersive transmission of a video conference. To visualize the general meeting in the main hall MediaScreen delivered a large-sized rear projection in 16: 9 format. With a screen tower 100 the general meeting was transferred to the adjoining rooms. 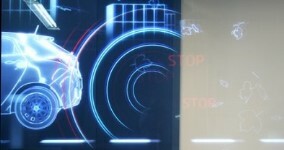 For the BMW booth at the IAA in Frankfurt MediaScreen planned and constructed nine large screen softedge projections. The projection contents had been generated by use of 18 cameras. Different clips were shown on a multimedia LED wall. For the presentation of new BMW technologies the exhibits were furnished with 40 plasmas and 24 i Drives thus visualising the car computer functions. In the main hall MediaScreen provided a huge tandem projection with two high power Digital Projection 15 SX DLP projectors. In the foyer, the general meeting was transferred on five Media Screen Screen Tower 100. MediaScreen equipped for Hugo Boss AG 22 stores worldwide, in which HUGO brand was sold, with projection technology of the newest kind. The exclusive character of the young label and its buyers should be reflected in the innovative HoloScreen POS solution. By the projection on HoloScreens the transparency of the store windows could be maintained and an innovative eye catcher was added to the window display. In order to enable the projection in the store windows the projection beam had been turned round by a mirror. As part of the Expo 2000 in Hannover MediaScreen realized complete Multimedia installations for numerous thematic and country pavilions such as the EU Pavilion, Clean Energy, Venezuela and much more. The elaborately staged worlds were brought to life through multimedia special effects and 3D projection. For the "EU Pavilion" three motion ride cinemas were equipped with each two Digital Projection 15 SX projectors, curved screens and Dolby Surround 5.1 audio systems. The "Energy Pavilion" was equipped with a mirror-deflected underwater projection. The "Pavilion Venezuela" was equipped with three extremely bright and high contrast rear projections. For the "Post Pavillion" an artistically motivated Kaleidoscope projection tunnel was made. The Congress was visualized by MediaScreen by three large-screen tandem projections. On movable screens the Digital Projection DLP high performance projectors projected data, live pictures and videos. For image presentation in the exhibition area MediaScreen delivered four ScreenTower 125 rear projection systems for displaying clear images in bright as day environment. For the event MediaScreen supplied three ScreenTower 100 and a 125 ScreenTower rear projection system to Tokyo. In the main hall four high performance projectors and five cameras had been used. The distribution of the signals was achieved via a control desk in the broadcasting van. The speakers’ desks were equipped with 12" TFT-displays. In addition the complete shareholders’ meeting was broadcasted on nine video walls and 120 TV screens in a camp that had especially been built for that event. For X-City Marketing, Hannover, up to now MediaScreen has made more than 30 Subway advertising systems based on projection. Especially for that purpose MediaScreen has developed diverse climatized and dust protection housings for the continuous operating of the projectors. MediaScreen’s air-conditioned projection housings enlarged the life-time of the projectors even under extreme environment conditions. MediaScreen constructed and built a at that time unique projection table for the booth of the German Telekom. This design was harmonically integrated into the booth concept. The projection table had a screen size of 2 m x 1.5 m and was a highlight of the exhibition area. The rear projection was achieved by means of a complex mirror re-projection with a minimum construction depth. On occasion of the the opening ceremony of the new Munich Exhibition Centre MediaScreen provided two huge rear-projections with each 145 m² (15 x 10 meters) as well as three on-projections with 70 m² (10 x 7,5 meters). The projections were made by 12 at that time brand new DLP high-performance projectors with each 12,000 Ansi Lumen. The new ScreenLifter 98 are available as Classic and LITE version from now! MediaScreen presents the world's first 100" Ultra-Short Throw HoloScreen rear projection screen! NEW! ScreenLifter 75. Now available! ScreenLifter Split for narrow-bezel displays – out now!